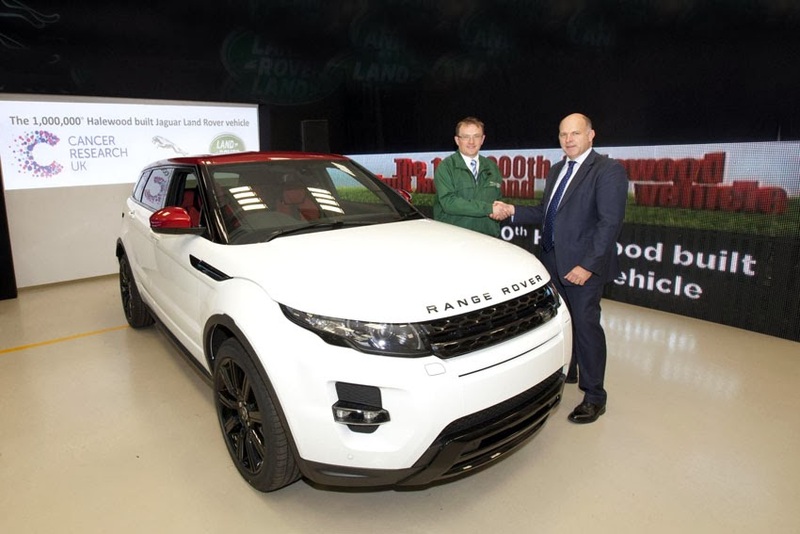 Jaguar Land Rover is celebrating the production of the 1,000,000th Jaguar Land Rover vehicle at its Halewood advanced manufacturing facility, near Liverpool. be donated to Cancer Research UK. The vehicle is a Fuji-White, Dynamic with ebony-black alloy wheels and distinctive and unique Firenze-Red contrast roof, matching Firenze-Red mirror scalps and red/black sports seats and interior door panels. Global demand for Range Rover Evoque has exceeded expectations with 18,000 advanced orders before job 1 on July 4, 2011. With continued demand for Evoque and growing sales of Land Rover Freelander 2, this production milestone was achieved earlier than predicted. Production volume at Halewood has increased significantly over the past 12 months due to 24 hour working, bringing the arrival of the 1,000,000 vehicle ahead of original forecasts. "We are delighted to be celebrating this huge milestone for Halewood. This unique Evoque looks stunning and is a one-off vehicle that will raise money for Cancer Research UK projects here in the North West," said Richard Else, Operations Director, Halewood. "Over the past few years many of the families of my growing team have been impacted by various forms of cancer. This milestone vehicle, built with pride at Halewood, will help raise much needed funds to help eradicate this dreadful disease."